Video games are a beautiful hobby. They can take us to other worlds, allow us to do things we can only dream of, tell us deep emotional brilliant stories, and they are just plain fun. My first video game was Super Mario Bros on the NES when I was just four years old. Although the Super Nintendo was out for a few years by then, my family was stuck with the NES. But that was a great thing because it allowed me to grow up on the 8-bit classics. I’m an early 90’s kid so my first console could have just as easily been a Nintendo 64. Mario and Duck Hunt quickly took over as my absolute favorite thing to do when I wasn’t eating peanut butter and jelly, watching Batman the Animated Series, and pretending I was all twenty-two players on an NFL field at once. Fast forward twenty years and gaming is still my definitive go-to diversion from the real world. Whether it’s playing Child of Light till the morning light is literally shining through my windows or being deeply interested and invested in the stories and advancements of our great medium or constantly checking on the smash bros website to see if any new characters have been revealed; I am always living and breathing video games. Every year around the same time I am baffled, perplexed, and downright annoyed by something that we gamers have to deal with. Summers… Why is it that there’s such a huge chunk of the year where there’s so little to play? There’s an epidemic on our hands and I think it’s time the industry takes a closer look at this and notices that there’s huge money being lost and wonderful opportunity for games to flourish this time of the year. 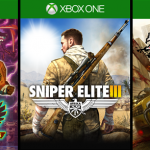 2014 was a good year for gaming. It was the first full year for the Xbox One and PS4; and with it came new exciting experiences but undeniable growing pains as well. The Wii U had it’s second full year in which they threw big-time punches with some big-time games. It’s usually the second or third year in a console’s cycle that we get the best games. And with some awesome stuff on the way, get excited for 2015. But before we do that, let’s look back at 2014. A year with some absolutely phenomenal games and equally bad ones. With great hype comes the possibility of great disappointment, that’s for sure. Some games reached that hype and exceeded it however. There are plenty of categories to cover in the Bam Game Awards (BGAs), so let’s get right to it. I’ll continue to add videos for categories like “Best Sports Game” or “Most Disappointing” or “Best Download Only Game”. I’ll end the 2014 BGAs with “Best Game of 2014”. Remember these are my own opinions, and I haven’t played EVERYTHING from 2014 so some games may be left out for that reason. But overall I got to play a massive amount of games in 2014 and I have some very strong opinions, I’m looking forward to sharing them. Stay tuned over the next few weeks, I hope you all enjoy the 2014 BGAs! Co-op in games has been a back and forth trend through video game’s young but beautiful history. In the arcades or on the NES we had plenty of games that took advantage of good old “player two.” Once three-dimensional games came into the picture, it seemed that co-op took a bit of a back seat to either single player epics or competitive multiplayer action. Who can forget the hours, nay days and months and years that many of us put into games like Mario Kart 64 and Golden Eye? Playing cooperatively in that era of gaming was slightly less popular than knocking your buddy out of first place with a blue shell. Thankfully, like the ebb and flow of the tide, co-op games have found a nice place in modern gaming. One of the reasons to be thankful for that is the wave-based hoard style co-op games that have found their way into many shooters over the past decade. Although this feature was sprinkled into several games, it was arguably Gears of War’s “horde-mode” that helped popularize the game-mode. And soon after, games like Halo, Mass Effect, Killing Floor, and Call of Duty all adapted a similar style of wave-based co-op fun. My own personal start to the wave-based subgenre was in Halo 3 ODST’s firefight. I wasn’t at the time the biggest Gears fan, but when Bungie gave its own spin on it, I was in. And wow was it fun! I was instantly hooked. My next step was backtracking to Call of Duty: World at War, and this is where my love for the Zombies mode took off like a forest fire. To this day it is my favorite of all the “horde” style modes. 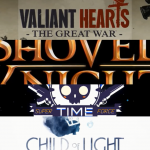 Now obviously each of these games has their own spin on the game mode. To directly compare Gears of War’s Horde mode to Zombies in Call of Duty isn’t really fair. It’s sorta an apple to oranges comparison, but apples and oranges are still both fruits after all. Just a few sentences ago I made a statement about my favorite “horde” style game—I may have to walk that back already. 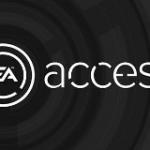 Because in actuality I’m finding out that there’s a new wave-based co-op game that might be taking the top spot. If it’s not my favorite, it is certainly the most fun. And fun is the bottom line for video games, isn’t it? On April 12 (2017), in a Nintendo Direct dedicated to Splatoon 2, Nintendo announced a new mode coming to the inktastic multiplayer shooter. That mode is called “Salmon Run.” And while I was instantly intrigued by its announcement, I can say that now that I’ve put weeks into the game mode, my love for Salmon Run far outshines what I even imagined. The original Splatoon for the Wii U was a surprising success and one of my personal favorite games on the failed console. So to see Splatoon 2 doing so well on the Switch, with a trajectory that looks to be the complete opposite of the Wii U, I can’t help but be happy for Nintendo. Splatoon 2’s regular online multiplayer is so enjoyable, and it’s one of the kings of the “one. more. game.” epidemic that many gamers deal with (me included). However the more I play this marvelous multiplayer, the more I realize something that shocks me. I think I like Salmon Run even better! As practically perfect that the inkredible gameplay is for multiplayer, it is somehow suited even better for Salmon Run. 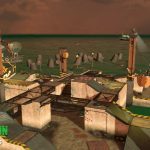 When I play Splatoon 2, I only want to do one thing, and that one thing is shooting the green guts out of Steel Eels, Stingers, and Scrappers! Now that I got the confession out of the way that Salmon Run is my favorite thing in Splatoon 2, I want to talk about why and how it compares to other wave-based game modes in other games and why it’s the most fun. Let’s start with the negatives. Obviously, Nintendo’s online infrastructure hinders the game. I’d love to be able to chat with friends as I do on my Xbox easily but it’s just not as simple. The smartphone app undoubtedly helps, but it doesn’t completely fix the problem either. But to be honest, given the parameters and limitations of the Switch, Splaton 2 and Salmon Run couldn’t do it any better. The timed openings for Salmon Run is kinda weird. As previously stated the number one thing I want to do in Splatoon 2 is play Salmon Run. But I can’t. Salmon Run is only open at specific times every day. They are open for 12 or 24-hour windows from times like 8pm-8am est. It’s such an odd choice by Nintendo, I can’t grasp the reasoning behind it. The cool thing is that during that time-frame I can collect bonuses and work my way up to a higher pay-grade. And it makes it feel like a mini-event whenever Salmon Run is open for business. But the timing choice could have still been handled differently. 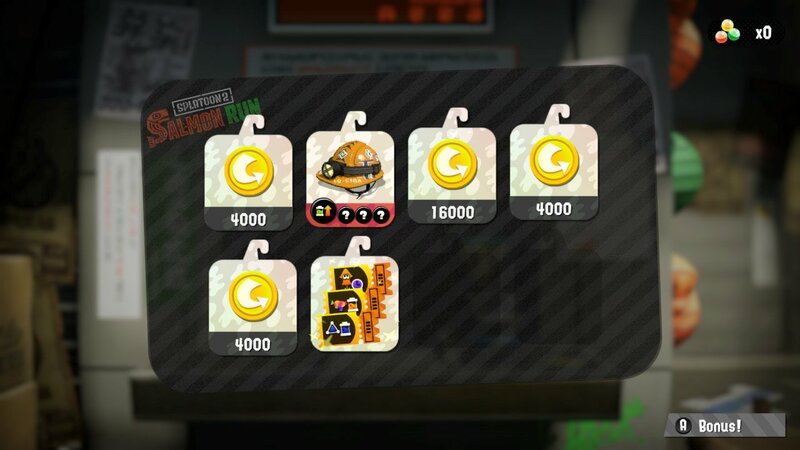 Imagine if the bonuses were just time based, that every 24-hours they would reset, but Salmon Run was still always open. It would create a similar strategy as far as allowing players to work hard for a short period of time and gain some cool prizes. 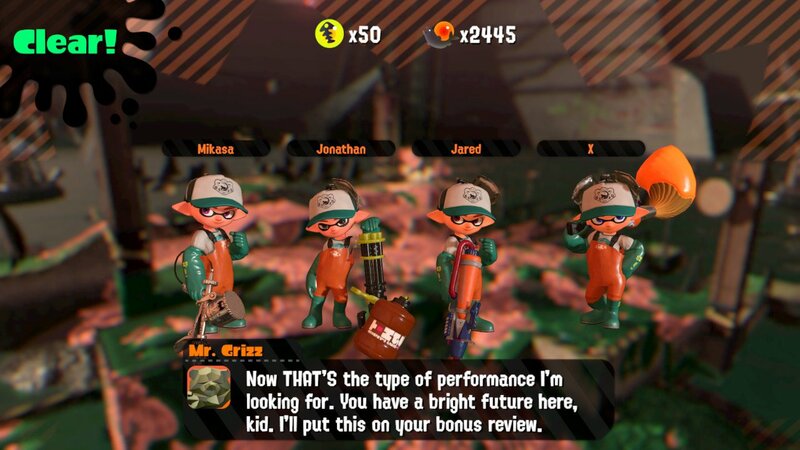 However it’s not all negative, the fact that Salmon Run is only open for a specific time creates a sense of urgency that suits the style of the game mode really well. For that small period of time, I have to rush in there and play as many matches as I can to get my prizes, and that adds to the slimy, grimy almost shady and sinister feel of the game mode. 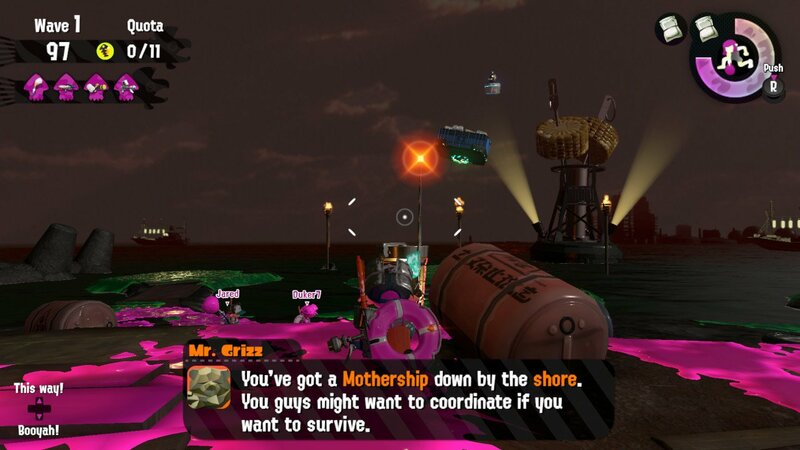 Something’s going on with Mr. Grizz. I’m not sure if he eats all those golden eggs or if he sells them on the black market or what, but even when you receive your bonuses from the man…bear? statue guy? he laughs ominously which is creepy and confusing. The whole game mode fits this peculiar and bizarre feel in the best ways possible. While the regular game of Splatoon 2 is all bright, colorful, flashy, and fresh—Salmon Run is run down, kinda gross, and a bit grim. It just feels dirtier, but its appeal is still undeniable. While competing in Splatoon 2’s multiplayer my squid kid is playing and having fun. In Salmon Run, that same squid kid is going to work and risking his life! 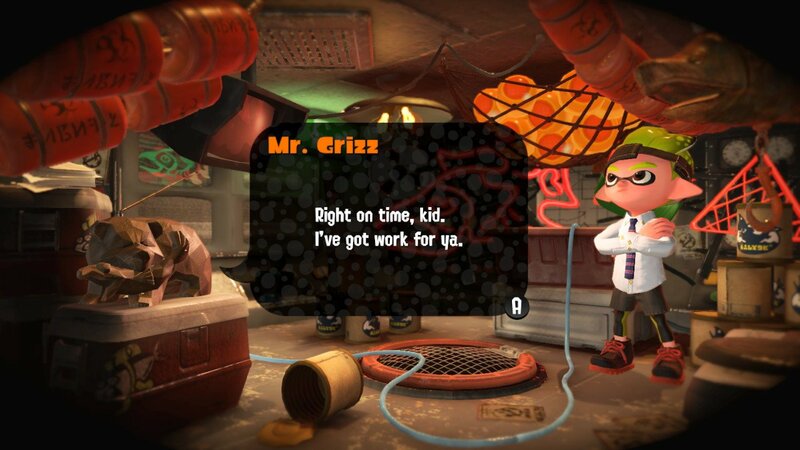 And Mr. Grizz honestly doesn’t care. He just wants more golden eggs! Also, the music is horrible. But amazing. It sounds like a seven-year old learning to play the violin, but it also is music to my ears. I don’t know how to explain it, it just AGAIN fits the feel and style of Salmon Run perfectly. On top of having a somehow seductively foreboding flair, one of the best aspects of Salmon Run is the enemies’ diverse and delightful design. Salmonids are the standard enemy in Salmon Run, they come in all shapes and sizes and can easily switch from being cannon fodder to overwhelming and obnoxious. They look goofy and are just amusing to shoot. The bosses are where the real challenge is, and where Nintendo’s seemingly endless fountain of creativity is shown off. There are Steelheads that throw gigantic explosions out of their head. Flyfish levitate in the air and launch missiles from the sky. The Maw swims under the ink and jumps out of the deep like a killer whale. 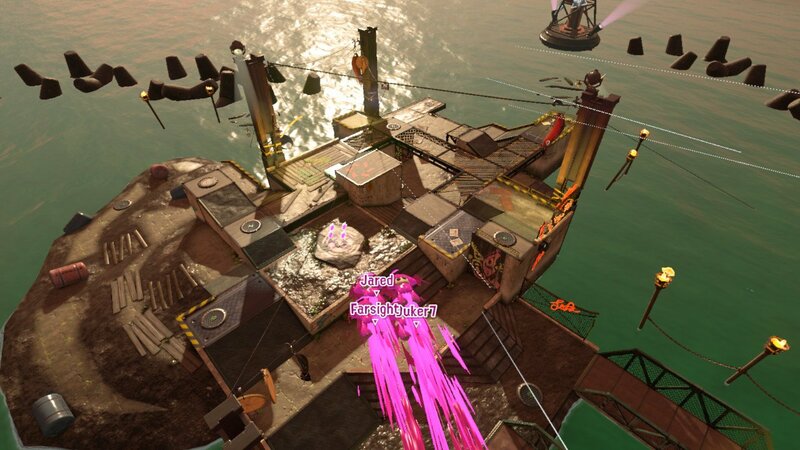 The Drizzler jumps in the air and rains down ink from above. Each of these bosses is hilariously designed. Some of which seem to have dangerous natural abilities like the Maw. While others, like the Steel Eel, are simply robotic creations controlled by a tiny Salmonid driving it around like an oversized bicycle. Whenever a boss has been killed, it drops three golden eggs, and to win a wave, the team must collect the quota of golden eggs which can be anywhere from 7 to 15 or so. Every boss also has to be taken down in different ways. 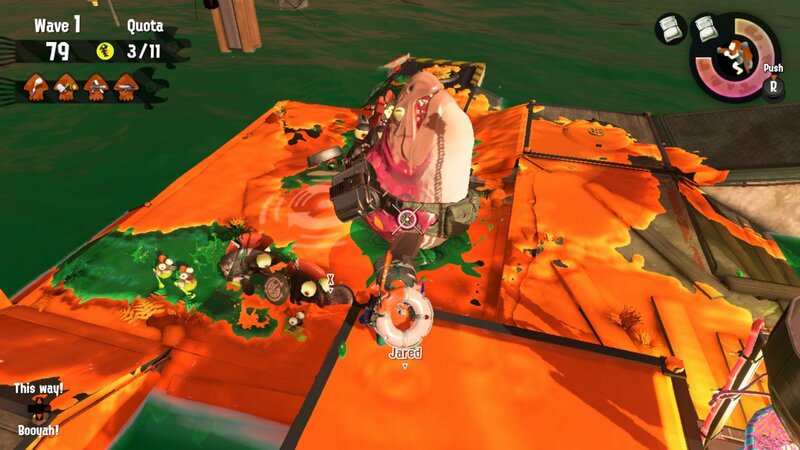 This is another way that Salmon Run is unique when compared to many of the other wave-based co-op games. In something like Halo’s Firefight or Call of Duty’s Zombies, unloading bullets into the enemy until they are dead is the way to go. However, in Salmon Run, there’s much more strategy than that. Some bosses need to be shot in specific areas, like Steelheads explosive skull. The Scrapper needs to be disabled first before you shoot at his behind to splat him. The Maw can only be killed by throwing a grenade at the exact location it’s attempting to launch out of the ink to devour the inklings. All of this diversity in taking down the enemies creates a required knowledge and skill—it also makes the game incredibly frantic when there are half a dozen bosses attacking at once. One round of taking down baddies can go flawlessly, and the next can be a total bleep-storm of insanity. One minute I feel like me and my team have it down pact, and there’s no way we will lose. 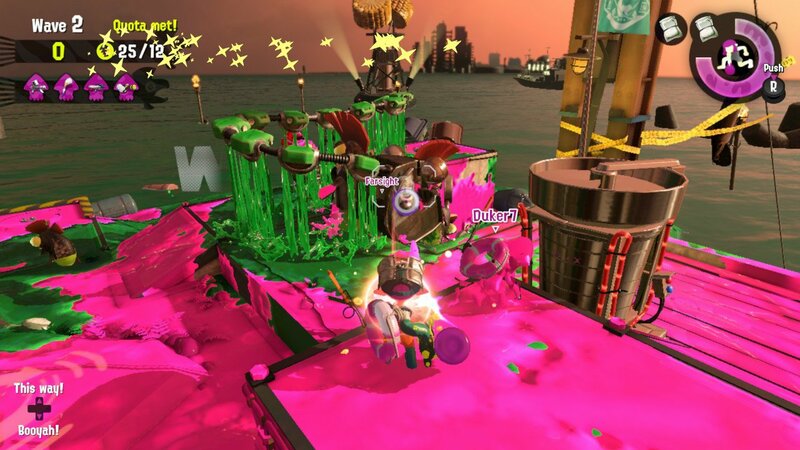 The next minute there’s two drizzlers raining down on us, a Stinger sniping from a distance, and Maws and Steelheads at every corner. As a team, if just one or two bosses is neglected suddenly it becomes a race to finish the round alive. The layout of the levels change round by round as well, something else that most other wave-based games don’t do. In round one, the tide may be all the way down, and there are bosses coming from every corner. But in the very next round, the tide could be as high as it gets and there’s barely anywhere to move. On top of crazy bosses and changing tides, there are rare special rounds with new bosses and surprising changes that genuinely caught me off guard the first few dozen times I saw them. And in fact, even though I am a “profressional, which is the highest rank that I can tell, just two days ago saw one of these special rounds for the first time (and with updates Nintendo could possibly add more). When these special rounds start, the sun goes down, and the eerieness rises. Motherships come to steal the golden eggs. Grillers mow me down with difficult hit points and tiny salmonoids as henchmen. World War Z zombie like salmonoids rush at the inklings a billion miles per hour as we fight to survive. Some of these special rounds that randomly appear can be absolutely brutal, I think I’ve only won two mothership rounds out of a dozen, but it’s still so much fun. 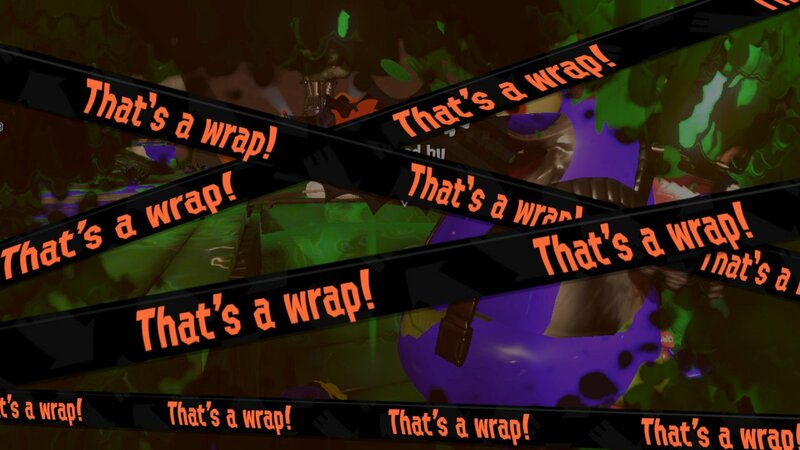 The mixed bag of miscellaneous bosses, levels of tide, random special rounds, and multiple levels (with more rumored on the way) truly creates a feeling that each match of Salmon Run is fresh and unique. I never play multiple games in a row and feel like I’m doing the same thing over and over. There’s even a mix of four random weapons that each days’ run of Salmon Run gives the players, so it forces new strategies and game plans. If I play one round with a slosher I have to play the next round completely differently when I use a charger. Sometimes it makes the game much more difficult, but it’s never detracted from the satisfaction. All of this forced variety abolishes boredom from the equation. I mentioned earlier that each round there is a quota of power eggs to fill. This again is something that set’s Salmon Run apart from other games of its type. Usually, the goal is just to kill all the bad guys in the round and survive. But in Salmon Run, there is a specific timer and quota that must be filled. If the time runs out and that quota isn’t filled, we lose! This creates a different kind of tension and excitement. 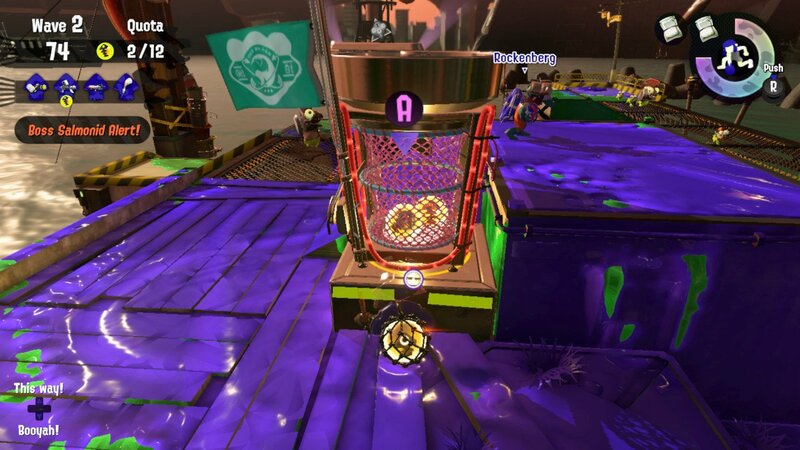 I can’t count the number of buzzer beaters I’ve witnessed and been a part of where I’m dodging ink rain from above, swimming past a dozen Salmonids and dumping the last golden egg in the basket with a second to spare. It’s exhilarating! There’s also been plenty of times where the opposite happens, where I’m inches away from the basket and time runs out! One of the greatest design choices in the game is the fact that Salmon Run is only three rounds. Again, this is a distinctive feature compared to other wave-based co-op games. Most of them either have endless rounds or a very high benchmark for the goal. In Salmon Run, it is only three rounds. Only three rounds mean a match is done in less than 10 minutes. A 10-minute match of COD: Zombies or Gears’ Horde is a failure. Only three rounds mean that I get stuck in the aforementioned “one. more. game” mentality and I just can’t put the game down. Only three rounds mean I can mix it up with the standard multiplayer of Splatoon 2 and have fun doing different things; as opposed to dedicating my night to one or the other. Only three rounds mean if I had a rough match with a group of bad teammates or an unlucky roll of the dice of special rounds and bosses, I can jump into the next game instantly and not feel like I wasted half my night. And maybe most importantly, only three rounds means that I feel successful after a good match! In COD: Zombies when I finally die, I rarely have a sense of accomplishment. If I only could have lasted one round further! With just three rounds for Salmon Run, I can pump my fist of triumph as I know, I kicked some tail and did the job well. If I lose in those three rounds, I want to jump back in and try again. If I won in those three rounds, I think to myself, that was awesome let’s do it again. 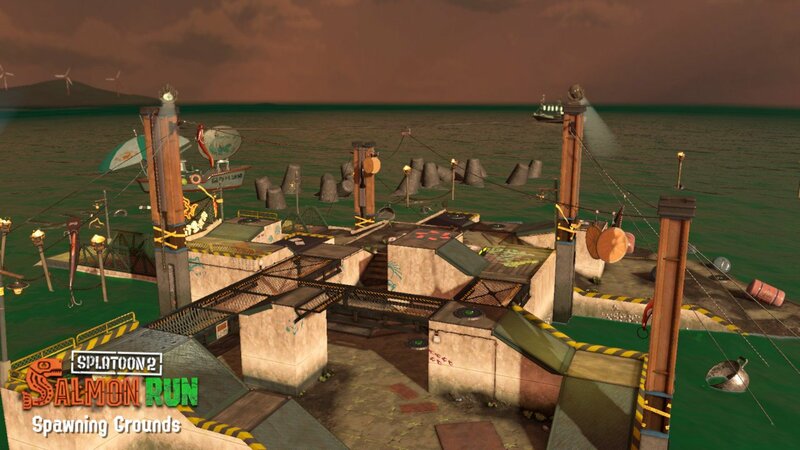 Salmon Run is definitely a relative to Horde Mode and other wave-based co-op game modes out there. But it stands out with unmatched charm and distinctiveness. I’m not sure if other games should mirror what Salmon Run has done or if Nintendo just knows how to do its own thing in its own way. What I do know is that Salmon Run is a blast. It’s weird. It’s fun. It’s strange. It’s adrenaline-charged. And it’s just so Nintendo. I’m constantly amazed by the Big N in this regard. Nintendo gets blamed at times for being behind the times with features and functionalities. But when Nintendo finally decides to dip their toes into something that they haven’t done before, they always create something that is special and unlike its contemporaries. Splatoon is an example of this in shooters. Arms is a recent instance as well. Smash Bros. created a subgenre of fighter types. When Nintendo creates, they either pave the way with a fresh idea that no one saw coming (dual screens anyone? ), or they follow up on an existing idea and create something entirely new and delightful. Salmon Run is the newest illustration of Nintendo’s genius. Yes, sometimes Nintendo makes me want to yank my hair out with utterly confusing ideas. But usually, they craft captivating creations that blow me away and keep me coming back for more.